Members of the Pagan community have been protesting over the use of the Long Man of Wilmington in a TV stunt for a new Trinny and Susannah show. The ancient hill carving, on the Sussex Downs to the north of Eastbourne, is considered "sacred" by the Council of British Druid Orders (CoBDO). A TV crew spent Sunday and Monday at the site, rehearsing and filming for a series about clothing and body shapes. ITV said it had gained permission from the Sussex Archaeological Society. 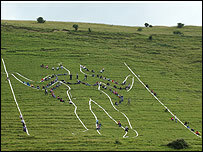 The stunt to be featured in Trinny and Susannah's new five-part series involved getting women to make a "human sculpture" which would alter the Long Man into the female form. But the CoBDO said it would "dishonour an ancient Pagan site of worship". Speaking from a protest at the site on Monday, spokesman Greg Draven said: "They've placed breasts and pig tails on the Long Man, and they've thinned his hips. "A lot of people might see it as a bit of light-hearted fun, but we object to a site that we hold sacred being desecrated. "We had to make our objections noted and our presence felt," Mr Draven added. ITV said the theme of the Trinny and Susannah programme was to "encourage women to dress for their body shape and not their size". The channel added it was taking "the utmost care... to protect this historical site". "The figure itself will not be permanently changed or affected in any way," a statement added.